This, Charge Shot!!! 's first guest post, is brought to you by friend of the blog Colleen Halpin. Colleen is studying art history at Case Western Reserve University, and also hosts a weekly radio show called Museum Without Walls on WRUW 91.9 FM. Let's get something straight before I start: I am not a hipster. I buy my clothes at Target and Old Navy, I hate the taste of PBR, when I'm not wearing my contact lenses I wear glasses that are an appropriate size for my face, and I've never smoked an American Spirit cigarette. I am not a hipster. 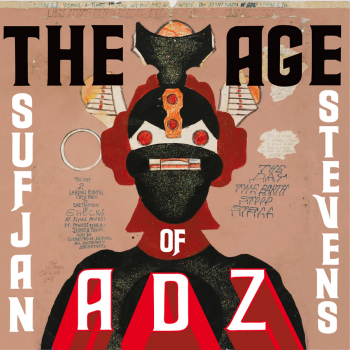 And so when I came across Sufjan Steven's new album The Age of Adz (Asthmatic Kitty) on the new music shelf at the college radio station with which I am affiliated, I groaned. 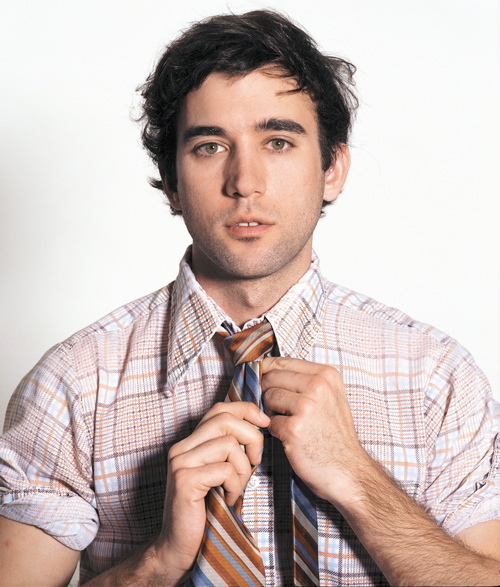 Not because I've listened to any of Stevens' previous albums and disliked them, not because the title needs a pronunciation key (it's pronounced "odds," by the way), but because every time someone like Sufjan Stevens releases a new album it’s a point for the hipsters. And I am not a hipster. This is his first full-length release since his 2005 concept album Illinois, a collection of songs about my home state and the second installation in his aborted plan to make an album about each of the 50 states. While this was a cool idea, I find it (and Stevens by extension) generally pretentious- an opinion that was only reinforced when I found out that he often performs wearing large, multicolored wings. I was thrilled to discover that, with Adz, he resisted the temptation to put out yet another indie concept album, which is growing tiring. Nonetheless, the album's presence on the new shelf was inherently bothersome to me, so I picked it up to make fun of what was sure to be a really pretentious cover. But the cover was actually pretty cool. The cover design and the liner notes (which are almost exclusively images) utilize the work of outsider artist "Prophet" Royal Robertson. Robertson's work is simple and almost childlike- lots of hard edges, lots of saturated colors, and has an overall science fiction/comic book theme. I'm not sure how appropriate this choice is to accompany the album, but I like the idea behind it. But how does the album sound? The first word I could think of was "intriguing." I had a little time to kill after my show when I found this album, so I popped it into the CD player in the production studio so that I could dismiss it more fairly. Usually I'll listen to a minute or two of the first song, then skip to the middle of the next few songs to get a general idea of how an album sounds and then make a decision about whether to put it back on the shelf or hold on to it for further listening. But I didn't do either with The Age of Adz. I put it in and I let it play. It starts off easy enough. The first track, "Futile Devices," is simple, beautiful, short, and the closest thing to Illinois you’re going to hear for the next 80 minutes. It's basically easing you into the album. If it was a longer song, or if more of the album sounded like this, it would be boring and I would let the hipsters have it, dismissing it as not rocking hard enough. But little did I know that Sufjan Stevens was getting ready to rock out in his own way. The beginning of the next song, "Too Much," introduces us to what I unfairly call the noise of the album. He combines electronic effects and unconventional instruments that I can't identify with my untrained ear, and they often come out sounding discordant. This really bothered me at first. I didn't understand why someone would write and record these really beautiful and pleasant sounding songs and then fill them in with this noise. But the more I listened to the album, the more I got it. I found that if I let go of what I was expecting to hear I was pleasantly surprised by how cool these seemingly discordant sounds could be. They hit you with this powerful sound, and if you just take them in you start to see that they are almost orchestral. Stevens' noise doesn't sound like something we often hear in music, but I found that once I got used to it and let it just happen, it actually helped to set off the songs that I originally thought it was intruding upon. The title track, as with most of the songs, goes through several shifts, almost movements, as the song progresses. It will go from harder instrumentation and noise, moving quickly into the softer sensibilities that fans of Sufjan Stevens are probably more used to. In several places he includes a chorus of voices to basically sing the backup ooohs and aaahs and chant strategically placed words. It's impossible to expect where a song might go - many of them take twists and turns so quickly, straying from the linear format that the listener might be used to. And this is what makes the album so interesting and, frankly, exciting. Full disclosure: I almost never listen to the lyrics of songs. I might pick up on them and sing along, but I never consider what it is that the musician is "saying." It just doesn't interest me. When I listen to music, I care about how it sounds, not the message. So where others might comment on the lyrical message of The Age of Adz, I am far more impressed by the way that the words sound, and “Vesuvius” is the perfect track to frame this discussion. Deep into the album, the track starts out refreshingly simple with just a keyboard and some voices (sure, they are electronically manipulated, but even this seems basic compared to the rest of the album). In the background of much of this song we have the chorus of voices, sometimes singing words, sometimes just making noise. They are just another instrument in Stevens' hands. This becomes more apparent as the song progresses. The vocals take a front seat, though they are broken down into a more rhythmic type of singing. Their place is not to show off the abilities of the singers, but to show how the words can work together and with the music to make more interesting sounds. The fairly convincing broken-down rhyme of "Vesuvius" and "Sufjan" once would have annoyed me, but here it works because (to me at least), all they are all sounds. The album climaxes in a rather self-indulgent 25-minute track called “Impossible Soul.” I dislike songs of excessive length even more than I dislike concept albums, but there are so many beautiful elements to this odyssey through Stevens' psyche that I somehow managed to get past it. Frankly, I don't see why he didn't divide it up into a couple more easily-digestible songs, but because the different parts are so disparate, your brain pretty much does it for you. It's a long haul, but in the end it's a beautiful and a very sweet way to finish off the album. 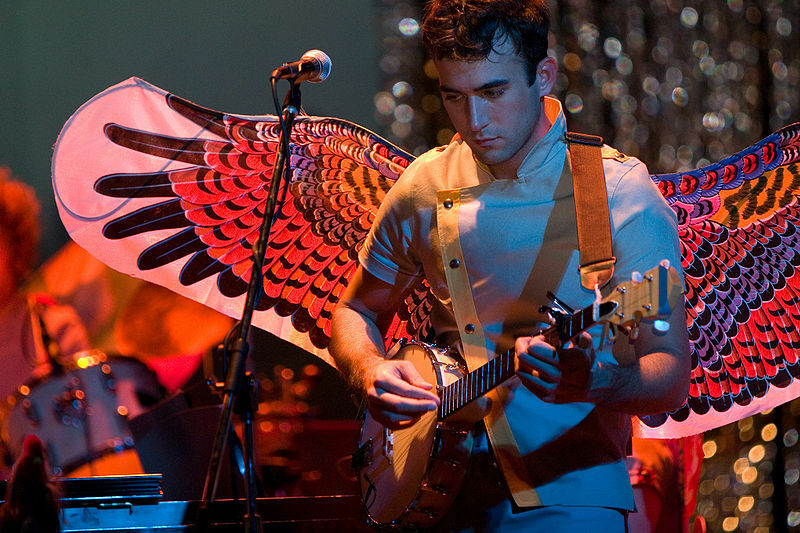 I suppose we'll have to wait another five years for Sufjan's next release - whatever it is, please, please don't let it be a concept album about a state.